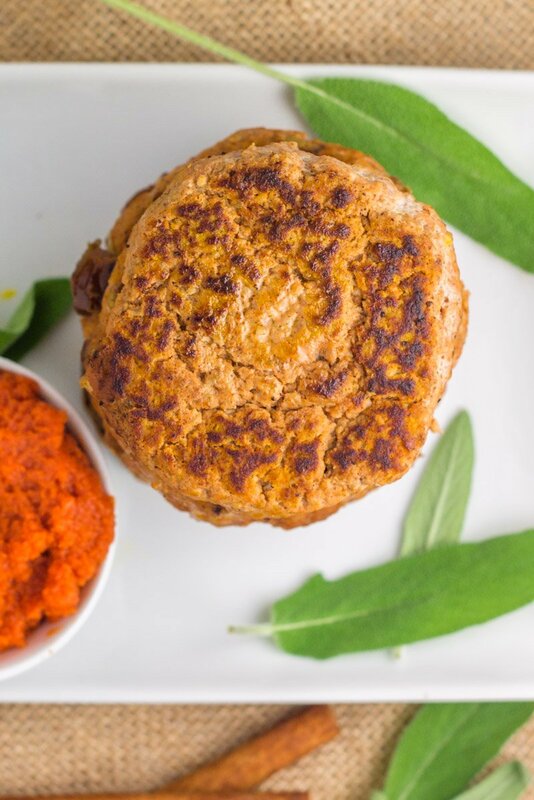 These paleo and Whole30 4 ingredient pumpkin breakfast sausages are the healthy eggless breakfast option, with a perfect balance of pumpkin flavor. A high-protein way to start your day, and a pumpkin-lover’s dream. YOU GUYS. I’m 150% obsessed. I try not to sound like a broken record when I promote a recipe that I seriously love, because I understand the word ‘obsessed’ is used far too often in my writing. 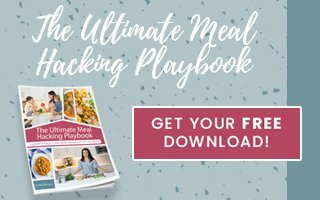 But even food bloggers have favorite recipes, and this is one of them (honorable mention to my other favorites like this easy paleo greek chicken skillet, Whole30 sloppy Joe bowls, Whole30 smoky sweet potato zucchini burgers, 5 ingredient Hawaiian chicken burgers, Whole30 Tuscan chicken spaghetti squash…ok, ok I’ll stop. But I could go on). Annnnyyyyway, I pinky promise, cross my heart, I love these 4 ingredient pumpkin breakfast sausages. I fully admit, I’m that OCD pumpkin crazy lady in the fall and I freaking love everything pumpkin. But let’s be real, most ‘pumpkin’ things are either a.) totally unhealthy and packed with sugar or b.) in baked goods. So God Bless all you Whole30’ers doing a 30-day challenge in the midst of pumpkin season. Seriously, I feel for you. Which is why I had to create a pumpkin creation that delivered that pumpkin fix you’re dying for, all while staying compliant. You might think pumpkin in a breakfast sausage is an odd combo, but lemme tell ya – it’s an AWESOMELY AWESOME combo. And what’s not to love when you can have an eggless breakfast sausage made with only four ingredients? I’m not knocking on eggs (if you know me, you know I eat eggs pretty much every single morning), but I hear all too often Whole30’ers sick of eggs every.single.day. Even though I don’t totally understand you (aren’t eggs like, life? ), I do want to serve you. And these 4 ingredient pumpkin breakfast sausages are how I’m doin’ it. I have three little secrets with this creation that I feel compelled to share. These are freezable. Freeze-worthy. Freezetastic. 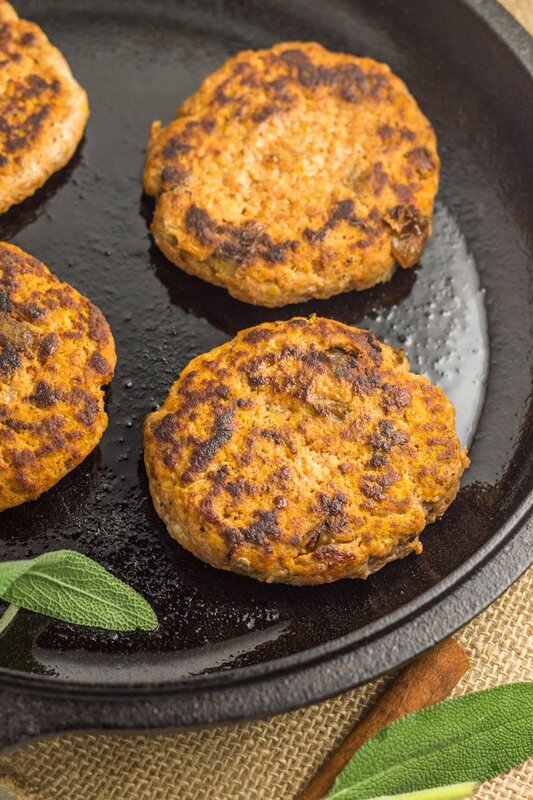 Whatever your word for awesomely perfect sausage patties you can make now and freezer for later. Which basically means you can have them on rotation all fall, then when March hits and you’re dreaming of pumpkin again, you won’t have to call around your local grocery stores to see if they still have pumpkin puree BECAUSE YOU FROZE 3 DOZEN! There’s nothing more glorious than that. These are baby-friendly. 4-teeth-approved. Babetastic. Whatever your word is for a slam-dunk protein source you can give to the little one. I created these babies (no pun intended) when my littlest only had 4 teeth. 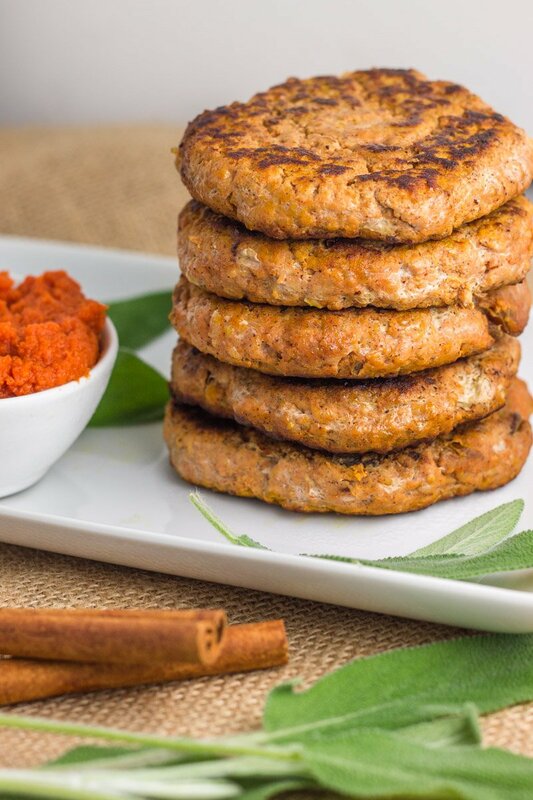 Since these patties are softer, due to the pumpkin puree, it’s a great option for the little ones with just a handful of teeth (but have the hang of ‘gumming’ or attempting to chew food. As for my toddler? DEVOURED. I could (and considered) calling these ‘3 ingredient pumpkin sausages’, because the dates are optional. Not a fan of a little sweetness in your patty, omit them! You’ll still get that beautiful hint of pumpkin flavor. But I admit, once you have the dates incorporated into the sausage, it’s pretty much ‘died-and-went-to-heaven’. Just sayin’. So many selling points! But so little persuasion needed once you sink your teeth into one of these perfectly pumpkin’ed breakfast sausages. Looking for a few other Whole30 breakfast inspiration? Check out this caramelized onion and butternut squash crustless quiche, balsamic ground turkey and apple breakfast hash, meaty marinara squash and eggs, and these paleo pizza egg cups. NOT doing a Whole30 and a lover of all things pumpkin? Then you have to try these mini paleo pumpkin pies, pumpkin pie mini marshmallows, or this paleo pumpkin pie microwave soufflé. 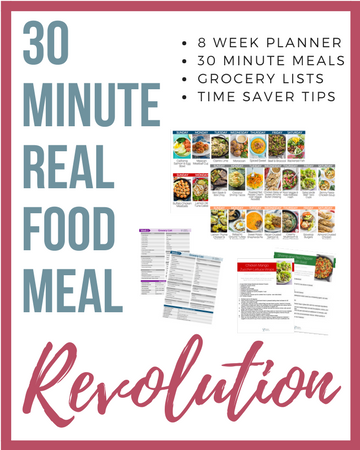 « 30 Minute Real Food Meal Revolution Release! Hi! What is the calorie count per patty? Thanks! I love your sloppy joe bowls.They are on regular rotation on my whole 30. 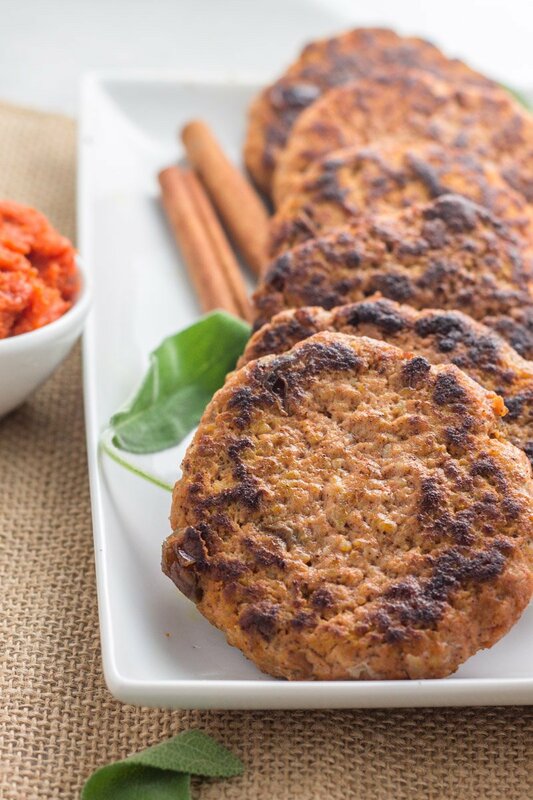 These sausage patties are going in my 101 compliant sausage recipe files because they are awesome. YAY! Thanks for your note Julie! made these yesterday for dinner (!) so good~! Wow…so delicious! Just made these for my breakfasts for the week! I’ll definitely look forward to waking up to these all week. Thanks for another great recipe!! This looks amazing! What are your thoughts on leaving out the dates? Do they act as a binding ingredient? Any substitution ideas? Just made a batch. After adding a hearty pinch of salt they are perfect! Especially with the chopped dates. Growing up, we used my Sicilian great grandmothers meatball recipe that includes a couple raisins tucked in the middle. Most people anticipate it’ll be weird but it’s so good to have that little bit of sweet in the meat! Sounds amazing too Ellen!! Thanks for the note! How do you recommend reheating them? You could certainly pop them into the oven or I just microwave them! How do you make your pumpkin purée? I buy mine straight from the can! I made these tonight and I am now officially obsessed!! These are so simple yet so amazingly delicious. I love your recipes and your style of cooking – I’m currently doing a Whole30 and am looking forward to my breakfasts this week thanks to you 🙂 love!! Is it weird that I can taste the alcohol from the pumpkin pie spice? Over never used it before and it seems strong to me. Really?!?! Pumpkin pie spice should not have alcohol ?? I made these last night and they fell apart. Should I add something as a binder. They taste good but I don’t have patties. Did you use lean pork or regular? Sometimes the regular pork has so much fat that it will prohibit the sausages from sticking together. Just made here and I am in love! But my were falling apart! Lol any tips on how to keep them together?? Thanks for the great recipe! Hi! Did you use lean ground pork? Sometimes pork in all it’s natural fat glory will make these too mushy to keep together. How can you make sure it’s done and crispy? Mine tastes good but the texture came out soggy. I also had a hard time making sure the patties stuck together. I ended up making hash. Thanks in advance for your advice! These won’t be super crispy, but also shouldn’t fall apart. Are you using a leaner pork? Sometimes if you aren’t, the fat naturally in pork will keep these from sticking together. Also, what type of oil do you prefer /find most effective for this recipe? Thank you! I just use a light oil spray. Coconut oil is what I used. Hi Miriam! I have heard ground turkey works in these! Keeper.. tried this morning with and without dates. I chopped one half of a date for my one large pattie. Hub actually preferred with dates. A new fav. Next time I’ll make plenty to freeze, I think🙃if I can stay out of them. Sweets aren’t a huge draw, but this would satisfy me instead of a cookie. Unusual, I know.thanks for lean pork tip! I’m so glad you liked them Julie! I have a few in my freezer as we speak!